Ever wondered how to make pickles? It’s easy. Making homemade pickles has been on my to do list for some time now. I’m a little behind the times; pickling everything has been a trend that’s come and probably gone and I’ve eaten more pickled foods than I have time to list here. From pickled watermelon rind (my favorite) to pickled fiddlehead ferns, chefs have found that a little bit of something pickled adds nice acidity to almost any dish. I decided for my first home pickling project, I should start with traditional pickled cucumbers. I used a recipe from David Lebovitz as a starting point, omitted the dill and added spices I had on hand like whole sumac to add some local flavor. To make dill pickles, simply add a big bunch of dill to the mix. I also threw in a carrot I had, just for fun. This pickle recipe takes about 5 minutes of hands on time and three days to ferment in a cool, dark place. After that they need to be refrigerated and will keep for about 1 week. If they last that long. But then you have delicious, crispy pickles, perfect for a barbecue or to eat right out of the fridge. You’ll never buy a supermarket bottle again. And here you have it, how to make pickles. In a small pot heat ½ cup of the water with the salt and stir until the salt dissolves. Add the remaining water. Pack the cucumbers vertically into the jar, making sure they’re tightly-packed. Add the garlic, bay leaves, mustard seeds, allspice berries, cloves, and sumac. Pour the salt water brine over so it comes to the top of the jar; the cucumbers should be fully submerged. Cover the jar and store in a cool, dark place (do not refrigerate). After 3 days, taste one. The pickles can ferment from 3 to 6 days. The longer the fermentation, the more sour they’ll become. Once the pickles are to your liking, refrigerate them. I know! I was thrilled to discover all of this as well. I forgot to mention also that I kept the cucumbers whole but if you slice them into spears they will pickle even faster; I’d check on them after 1 day in that case. So easy – who knew? I love pickles, so I’ll be sure try this. Awesome! I feel the same way – when I finished I was like, that was it? Amazing. I love how simple this is! I have always been somewhat intimidated by the pickling process. I can definitly try this out. I am so glad! Let me know how it turns out if/when you do make them. I also enjoyed the simplicity of the process. There is something very satisfying about it. That is so great! If you can’t find sumac don’t worry, I just threw that in because I had some on hand. Check out this recipe: http://www.nytimes.com/2005/11/09/dining/093crex.html?_r=1&oref=slogin and this recipe: http://www.chow.com/recipes/10594-pickling-spice for ideas of what other spices to include. I hope your son enjoys! So these are QUICK pickles, or refrigerator pickles. They are very similar to quick, or refrigerator pickles. But most quick/refrigerator pickle recipes I know require the fermenting to be done in the fridge. These pickle in a dark, dry place and once they are the level of sour you’d like are transferred to the fridge. Quick pickles usually require you to pour a hot/boiling mixture over, and they can be eaten right then and there are refrigerated. So I don’t know what I’d call these! All I know is they are delicious! 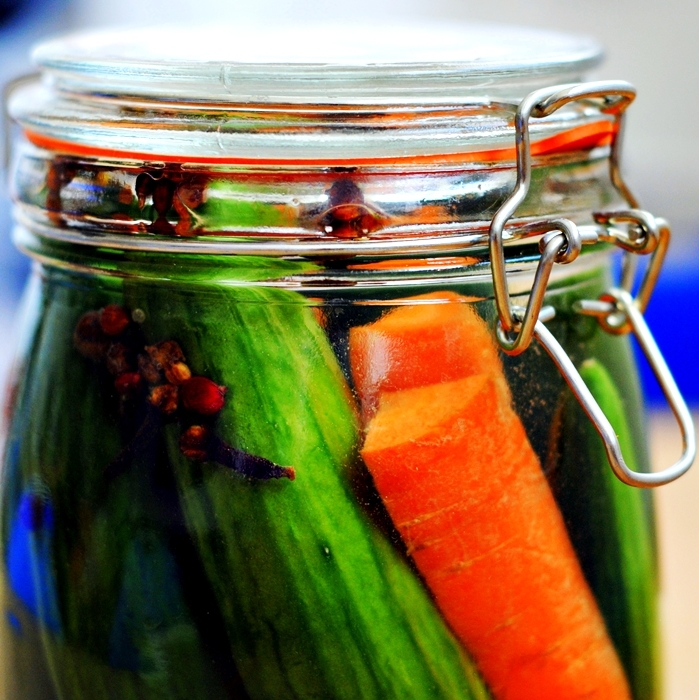 Love lacto-fermented pickles without vinegar…I make them quite frequently and am definitely due to put up a batch! These photos are beautiful! I love pickles and I always forget how really simple they are to make. Love it! Thanks so much! So glad you stopped by. My pickles turned to mush in 2.5 days. they looked okay from the outside but when I touched them they caved in and liquid came out. they were mush. what did I do wrong? Oh no! Hmmm… from what I’ve read it seems that could have happened for a few different reasons. First, if the cucumbers aren’t super fresh to start then they could end up mushy. Another cause could be if the place where they were stored was too hot (a common problem in the summer). The optimum temp is 70-75F. Finally, if there isn’t enough salt in the brine or the cucumbers aren’t covered they can become mushy. I hope this helps, and that they come out better next time!! Just tried your recommended recipe. They turned out fantastic! I live in Thailand, so 70-75f is difficult to achieve, but they were in a dark, dry place for 3-4 days and it worked. Didn’t have sumac, but added some good dry dill. Will never buy pickles again. These are the best. Thanks to you and David L.
I am so so so happy to hear that!!! Dill sounds like the perfect substitution.